I've had a few close calls on my bike this past week during daylight hours with cars coming off side streets and almost hitting me while cycling through the intersection. All of our bike lanes have no visible markings at intersections to warn drivers to stop 'behind the green stripe' like every other city I've biked in does. York Boulevard and all of its side streets have absolutely zero markings at intersections - not even crosswalks for pedestrians. This results in drivers coming full-speed down the side street and rolling right out as far as they can before hitting the live traffic lane. The thick white lines on either side of the green markings are very visible both in day, and evening to drivers. A new one just like this was recently painted at the southwest corner of Main and Dundurn and at the corner of Sherman and Cannon. Absolutely nothing. This is a very dangerous design, and creates these huge gaps in the bike lane where folks approaching from the side street have no clue that they are about to drive right into a bike lane. 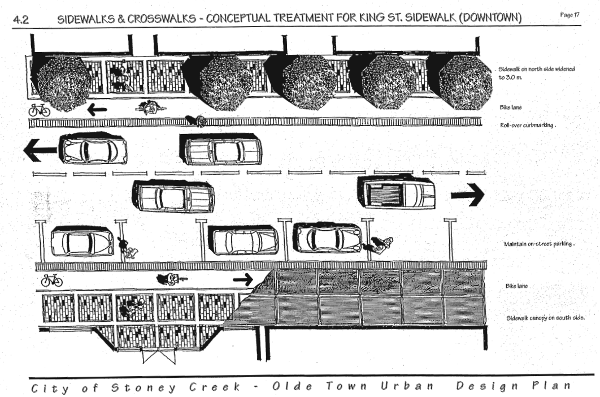 Streetsblog has a good overview of Seattle's approach to bike lanes on Broadway. In light of recent tragedies on Hamilton Streets, I think we should make these types of safety improvements city-wide at all bike lanes and trail crossings (think Hamilton-Brantford Rail Trail through West Hamilton). Despite the lack of a connected network of protected bike lanes in Hamilton yet, there are bike lanes in every geographic area of the city. Meaning, if we rolled out these new standard intersection treatments, everyone would get used to them very quickly by seeing the same infrastructure and street markings in every ward. This same principle is being used to roll out our new Pedestrian Crossover (PXO) crosswalks next year: at least one in every ward in order to help educate drivers rapidly. We've got the money, and the design work is now known and easy to implement. It's low-hanging fruit that would send a strong signal that Hamilton is upping its game when it comes to safety. The best part is that it only requires paint and road stencils! The good news is that the City's Cycling office will be merged into the Traffic Operations and Engineering, so we will hopefully start to see cycling infrastructure integrated more normally into our street designs. According to an email response from David Ferguson, superintendent of traffic engineering, they "have already had some discussions on potential for improvements to the cycling program which we will continue to discuss and finalize over the coming months." I am somewhat opposed to "cheap" fixes for bike infra while the city is throwing away millions on the Hwy #6 boondoggle. How about a real ontvlecthten or unraveling of bicycle and car routes? Stoney Creek concept art. 1997 plan. Approved as a 15-year plan. But what's there is just a Concession-style redo. While somewhat of an upgrade, it's extremely disappointing in comparison to this concept art. 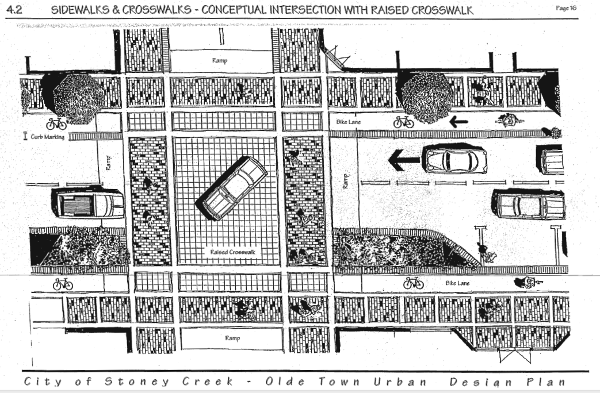 Click on "Stoney Creek Olde Town Urban Design" link on this hamilton.ca web page. It's interesting that you make reference to the "Cycle Office". In reality the 'office' consists of one individual, Daryl Bender. Also, while moving Mr. Bender into Traffic Operations and Engineering makes some sense, it isn't a complete solution. New roads and reconstructed roads are designed by Engineering Services which, if I'm correct, is in a completely different division than Traffic under different management. If better cycling infrastructure is the objective here then there needs to be better integration into where the actual design and engineering takes place. My understanding is that Traffic deals more with making changes/improvements to existing roads and not with reconstruction such as what has been done for Consession St and King St in Stoney Creek - these types of projects are the responsibility of Engineering Services. Does anyone really know where the design responsibilities are within the City? I'm not sure that traffic is the correct part of the City to be approaching for change. Maybe the questions need to be directed elsewhere like Engineering Services or Planning? Anyone know if what I'm assuming about structure is right? "Can I donate a bucket of green paint? Might save a life."